Just Jingle: I am SO Lucky! Why? Well, because I figured out how to make a Valentine's Day card for a man. At least, I think I did. You see, butterflies are bugs and boys like bugs, so I figure it works. Just say'n. This card was initially inspired by the Cutting & Trimming Challenge in the Moxie Fab World. My Purple Cows trimmer has a guillotine side that I use most often, but it also has a rotary cutter side that I use on occasion. What I often forget, is that it has some pretty fun extra blades for that rotary side and this challenge reminded me to pop one of those suckers in! I LOVE the wavy cut details on this card! The other cutting tool that got some action for this one is my tried and true trusty pair of Cutterbee scissors! I LOVE those things! 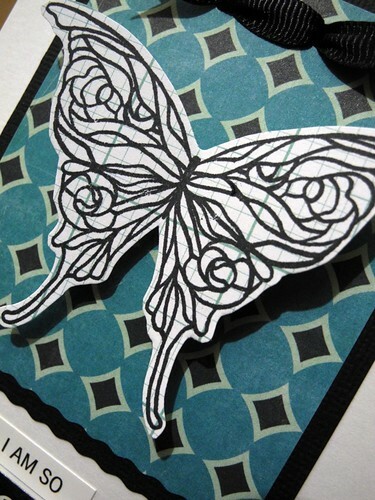 I use them to do my detail cutting, like cutting this butterfly from the patterned paper it was stamped on. And, of course, my straight cutter did a bit of work for this one, too. It's funny how something so subtle can add SO MUCH to a card! I can't tell you how much I LOVE those wavy cuts! I'll be using that blade more often! Oh...and the patterned paper and stickers are Echo Park (*LOVE! *) and the butterfly is one of my favorites from Skipping Stones Design! As for today...well, it's Monday. Let's make it a good one! Have a Happy Day and don't forget to smile! This is so pretty! I love the butterfly on the grid paper! great card! you can never go wrong with a butterfly! I think this was my first SSD stamps and still remains one of my favorites!! Fantastic card!!! Very pretty card. But of course, I mean pretty in a very masculine, buggy sort of way! Great job!! I think you did too!! Love the card Jingle!!! 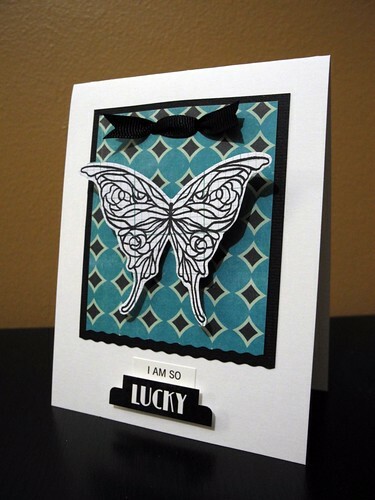 Love the butterfly stamped on pp and the wavy cute edge! The colors are also very bold and masculine-love it! very nice card -- luv the colors! That man in your life will love this and he will be saying to himself, how lucky he is to have such a talented lady in his life. 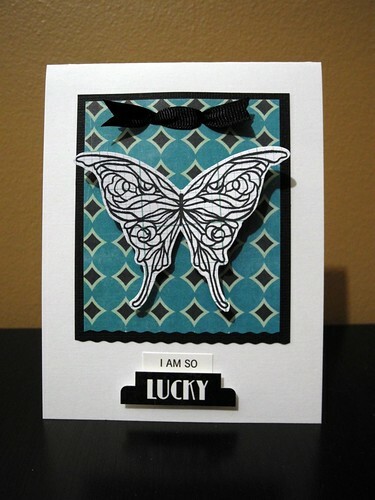 it is gorgeous, perfect colour combination, love the butterfly stamp! What a fun, graphic card. Love the sentiment and how it's placed. "Boys are like bugs." So true. LOL, I don't know if the men I know would consider butterflies masculine but I love this idea! Great colours and design, Jennifer! :) this is just PERFECT! I think it works for a man too... I think it's beautiful either way! Love the grid base on that b'fly... very cool colors/design! Definitely made me giggle - butterflies are bugs & boys like bugs indeed :) lol! I love this phrase for a Valentine-y card, and the ribbon technique looks really cool! And you are so lucky to be so talented! Wonderful card!